Digging through kitchen drawers looking for the right spatula is no fun at all. But, you can easily organize your kitchen drawers and be able to quickly find exactly what you need when you need it. You can have organized kitchen drawers in less than a couple of hours. SHORT ON TIME? 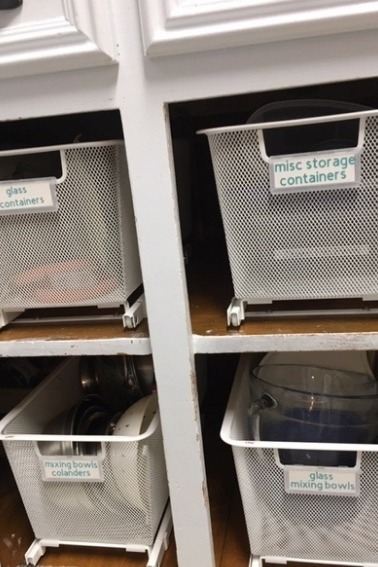 SAVE TO PINTEREST NOW & READ ABOUT HOW TO ORGANIZE KITCHEN DRAWERS LATER! What is the best way to organize kitchen drawers? An organized kitchen saves so much time. It seems most of my days are spent in the kitchen so to be efficient, I need to be able to find what I need quickly. 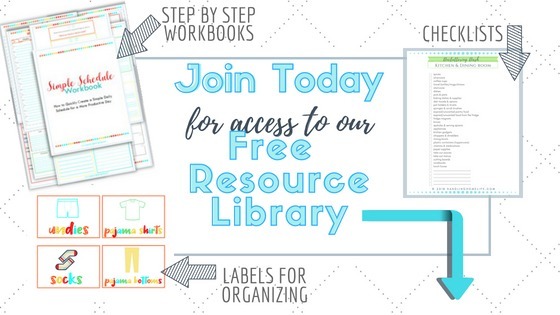 Organizing doesn’t just save us time—there are many benefits you will reap when you get organized. My kitchen is definitely on the small side…our house was built in 1970 so it could certainly use a kitchen remodel. When we bought this house 3 years ago, the FIRST thing I did before moving in…. Painted the ugly orange-ish wood cabinets! I worked endlessly for 3 or 4 days straight to finish the project before moving in. Since I was in such a rush, I didn’t paint the inside of cabinets or drawers and I kind of wish I would have. Oh well, that’s a project for another day! 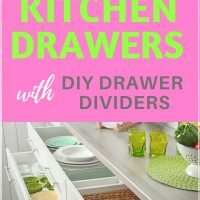 Let’s look at how to organize all those drawers in your kitchen whether they are painted or not. 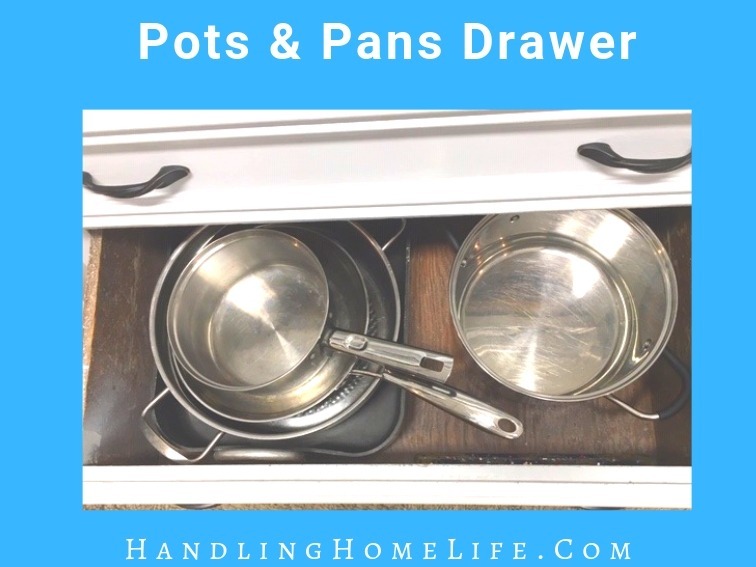 If you need to organize the rest of your kitchen, then be sure to check out my post that walks you through the steps to organize kitchen cabinets. And if you’ve decluttered and organized but your house STILL looks cluttered…. Then read 18 THINGS MAKING YOUR HOUSE STILL LOOK CLUTTERED. How do I organize my kitchen utensil drawer? I love organizing a drawer! It’s easy to tackle just one when you find some extra minutes during the busy day. It’s a quick win! First, take everything out of the drawer you are going to organize. Clear your counter top so you have a place to put everything. Now, decide which items don’t even belong there….are they broken? Have you used it in the last year? How about in the last 3 years? 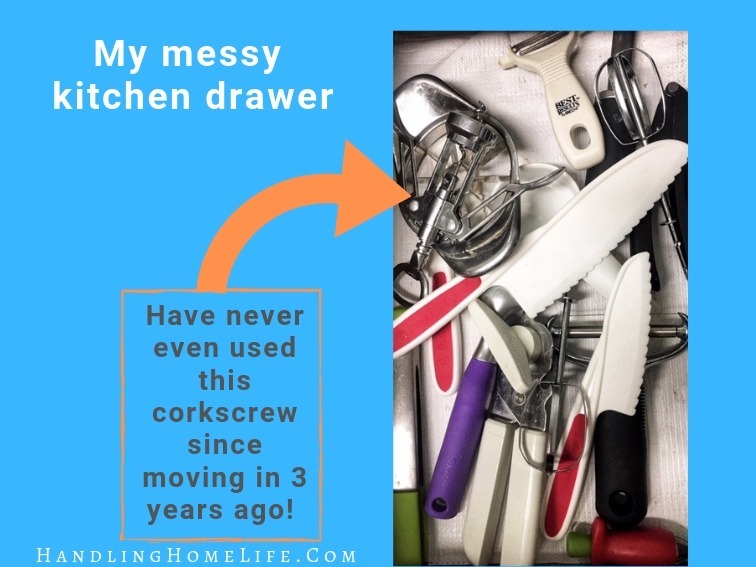 I seriously have not used this corkscrew since we moved in (3 years ago), yet here it is taking up space in my tiny kitchen. Why in the world would I waste precious kitchen drawer space with tools I don’t even use? 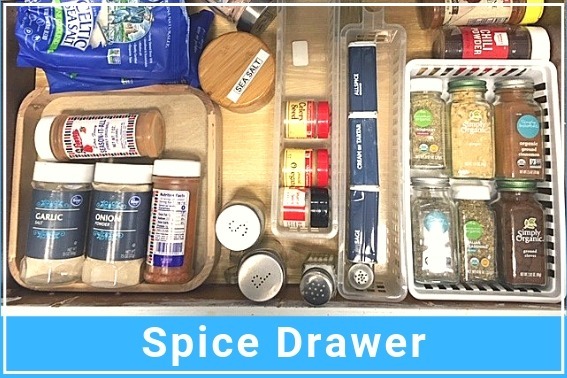 So the first thing we need to do is decide which kitchen items deserve a space in the drawer. You want to put like items together and place in the drawer that makes the most sense. You don’t want all of your potholders in the drawer that’s far away from the oven. Take some time and think about the most logical place to put things. Once I’ve chosen what gets to live in that drawer, it’s time to decide on drawer dividers. I have purchased and use many different types of drawer dividers but I like making my own. It’s so incredibly simple, extremely cheap, and I leave no unused space in the drawer. I use craft wood that is almost 3 inches wide and about 1/4 inch thick. They come in long strips and can easily be cut to whatever size you need. Home improvement stores always have these and Hobby Lobby does as well. 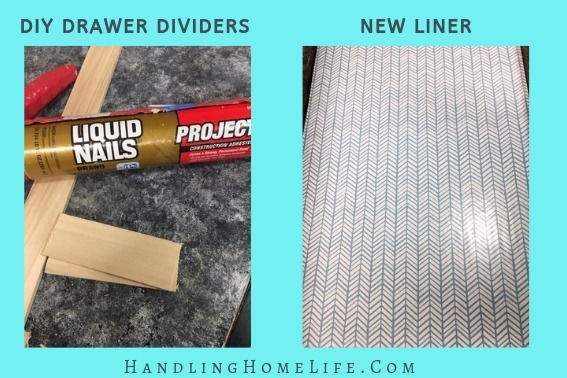 These DIY dividers are great when organizing any drawer and will come in handy with these bathroom organization ideas too. So the first thing I do is sort of arrange everything inside the drawer so I can decide how many sections to make. Then, I cut the wood to the sizes needed. Using wood glue, liquid nails, or a hot glue gun, stick the wooden pieces together. I don’t clamp or anything…i just let it sit on a piece of wax paper to dry. While the wood is drying, it’s time to give the inside of the drawer a good scrubbing. Non toxic cleaning supplies will get the job done safely. It’s non toxic but as effective as bleach and is the only cleaner that doesn’t bother my asthma and allergies. This is a good time to also replace the drawer liner if needed. I picked this one up on clearance—so while it may not be my favorite pattern, the price made me like it much more! After I have the drawer cleaned and prettied up with new liner, I’m ready to put the divider in. I put a very small bead of hot glue along the bottom of the divider and placer it directly onto the liner. This keeps it from shifting all around inside the drawer but doesn’t damage the drawer either. This step isn’t necessary, but I like the stability. You can paint the divider if you like, but I don’t like to wait for the paint to dry, so I usually just leave them natural. Now you’re ready to place your kitchen utensils back into the drawer all nice and organized! TIP: If your hot glue gun gets super hot you should let the glue cool for a few seconds after you apply the small bead of glue to the divider. How do you organize deep kitchen drawers? I only have one deep kitchen drawer and I use it for my pots and pans. There is a more shallow drawer directly above it and that is where I store the lids. Be sure to purge the pots and pans that you no longer use. Do you need four 2 quart saucepans, or could you donate 2 of them? After you’ve decided which pots and pans you will keep, match the lids. Any extra lids get donated. 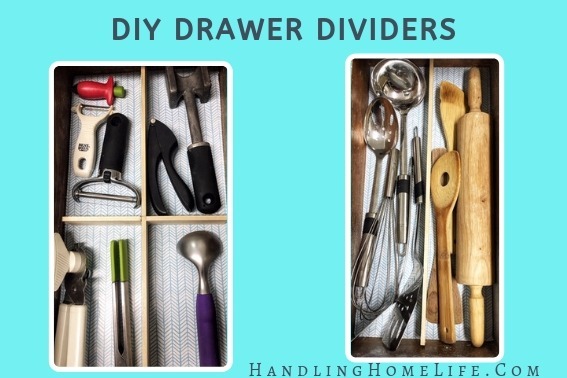 If you don’t want to do the DIY dividers, you will certainly be able to purchase right drawer dividers and organizers. You may already have things you can repurpose as a divider. In my spice drawer, I have some random baskets to keep everything separated and contained. If your kitchen is like mine and doesn’t have enough drawer storage, you can easily add these Elfa mesh easy gliders from The Container Store. They come in many different sizes and are super easy to install. I love how much additional storage they provide! 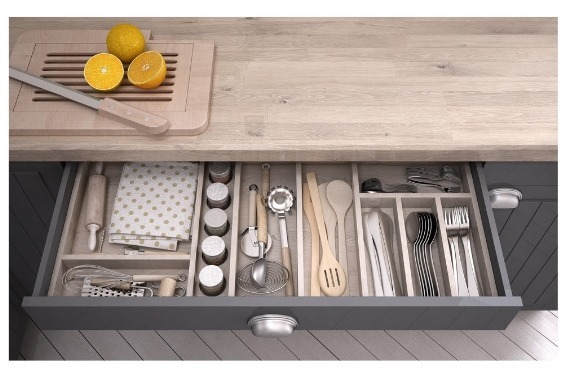 What are your favorite tips for organizing kitchen drawers? Be sure to leave a comment and let me know!